In this post I talk about the recent SharePoint Cincy event. I also cover some of my upcoming activities for the next month, including a trip to Denver and SharePoint Saturday Twin Cities. 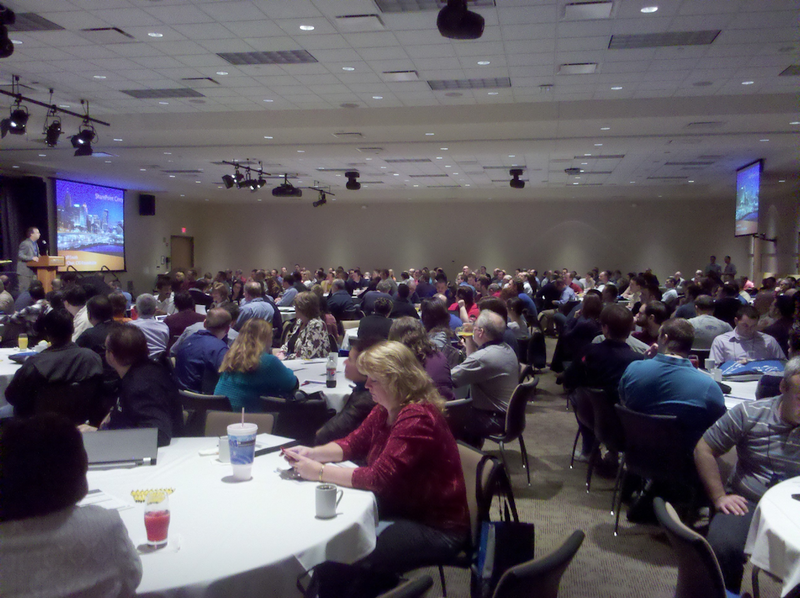 On March 18th, Cincinnati saw it’s first (arguably) “major” SharePoint event. SharePoint Cincy was put together by Geoff Smith, the Cincinnati CIO Roundtable, and MAX Training … and it was a huge success by any measure. I took the picture on the right during the introductory speech by Geoff Smith, and it should give you an idea of well-attended the event was. I was fortunate enough to deliver a talk on disaster recovery during the day, and I also helped Geoff and the organizing committee in advance of the event with some of the speaker round-up for the IT professional / administrator track. I enjoyed the event because the audience composition was different than one would typically find at a SharePoint Saturday event. Many of those in attendance were IT decision makers and managers rather than implementers and developers. I attribute the high numbers in my DR session (typically not a big pull with technical crowds) to that demographic difference. The next SharePoint Cincy event is already planned for next year (on March 12th, I believe), so keep your eyes peeled at the beginning of next year! Some fine folks in the Minneapolis and St. Paul area (Jim Ferguson, Sarah Haase, and Wes Preston) have worked to assemble the upcoming SharePoint Saturday Twin Cities on April 9, 2011. Like all SharePoint Saturdays, the event is free for attendees. There’s plenty of good education and giveaways to make it worth your while to spend a Saturday with other SharePoint enthusiasts. … for a day of high-quality and free training. You can register here on Eventbrite! Idera partners with a number of different companies in order to make its software more available, and one of those companies is Prinomic Technologies. Prinomic is a consulting company based out of Denver, Colorado, and they focus on the creation of solutions that employ and target SharePoint. They are somewhat unique in that they offer a combination of both services and products, and it affords them a great deal of flexibility when addressing customer needs. I’ll actually be traveling out to Denver to deliver a lunch-and-learn in conjunction with Prinomic titled “SharePoint Disaster Recovery Options” on Wednesday, April 13th, 2011. The lunch and learn is open to the public; simply follow the link (above) to register if you’re interested. Knowing that I’d be out in the Denver area on April 13th, I reached out to some of the folks I know there to see if I might coordinate something with one of the local user groups. I love speaking, and it was my hope that someone would actually grant me some more time with additional SharePoint geeks! I was very fortunate to get a reply back from Dave Milner. Dave and Gary Lapointe run the Colorado Springs SharePoint User Group, and they mentioned that it would be okay for me to come by and present to their group on the evening of the 13th. So, it looks like I’ll be heading down to Colorado Springs after the lunch and learn with Prinomic! Meet-and-greet activities are from 5:30pm until 6pm, and the session begins at 6pm! Finally, I wanted to mention a series of events that are both going on right now and coming soon. My good friend Matt Hester, our region’s IT Pro Evangelist with Microsoft, is traveling around putting on a series of Technet events titled “Transforming IT from Virtualization to the Cloud.” These events are free training and center on cloud computing, why it is important, private vs. public cloud options, etc. The event looks really cool, and it’s being offered in a number of different cities in the region. I’ve already signed up for the Cincinnati event on April 6th (a Wednesday). Check out Matt’s blog post (linked above) for additional details. If you want to sign up for the Cincinnati event on April 6th, you can use this link directly.